3rd generation GM loyalist here... and done with them. Their executives have made incredibly poor and stupid decisions over the past 5-10 years. Not to mention, whoever is over their design and styling departments needs to be sh*tcanned YEARS AGO! The new Silverado HD just released=an absolute joke! Most horrendous design of a vehicle in literally ages. For example somehow there's a TSB out for my torque converter that causes vibrations that could cause oil to leak into the radiator. Well it did, and they wanted to bill me $2700 to replace the radiator because the radiator is an external component and not part of the power train, therefore unnecessary to the operation of my truck. I did it myself for less than 1/3rd the price but the fact there is a KNOWN issue with their vehicle and the refused to cover the repair REALLY pissed me off. The vast majority of 2014-2016 Chevy SS's have been recalled for a faulty power steering unit that fails without warning. My car, a 2015, was one of a handful that received a band-aid fix of using nyogel in the bad connector at the factory so of course I'm excluded from the recall. Guess what, nyogel cars have been failing as anyone could have predicted, and so far GM is refusing to cover the $2K-$3K replacement for those out of warranty. I have 3K miles left on my warranty and will no doubt be paying to fix this within the next year or so. There is also a known issue with failing MagRide shocks that they may or may not help cover the cost of. No recall on those since it won't cause you to put your family sedan into a wall I guess. Anyway, I love my car, but GM has really dropped the ball on this so far. That's $5K-$6K worth of potential repairs to a car before 50K miles. Unacceptable in my opinion. I can't lie, I don't hate the new blazer. BUT I also think it looks like they just copied Ford and Toyota's homework... lol. That Silverado though?... Really, I'm just not a fan of the direction ANY of the truck designers have gone. I think all the front ends on the new full size trucks across the board are garbage. That... and you got the short, bland, boring, ho hum end of the design stick. All they had to do was just import it over with Chevy badging... But no. Ha well that version is quite a bit more expensive than what I bought. I actually like the styling on mine, but understand why not everyone would. A blackout kit, dialing in the wheel spacing, and eventually a mild drop make it just right for me. Agreed though, the HSV's are very cool. I don’t hate the new Blazer... the proposed interior is incrediballs... but why? You already have an Equinox and a Travers that look identical. Why build another vehicle that looks and performs EXACTLY like those two? Just stupid. The public clamored for a (near) full size, but trail/off-road capable vehicle... LIKE the original Blazer. That’s not what is coming out. So disappointed. 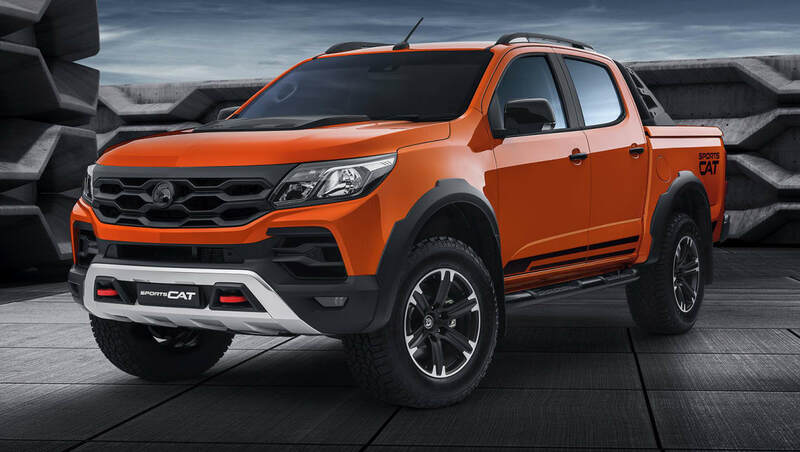 But hey, I fully expect Ford to eff up the Bronco as well. And yeah that new Silverado HD is quite possibly the worst thing ever. It’s seriously hideous. Like “I’d rather be spotted in a 1981 Chevy Citation X-11” hideous. Is it too much to ask for an SRT Grand Cherokee competitive Trailblazer SS? Oh I like the SS... just think it coulda been brought over with a much more aggressive look. I love my GTO too... but would I had rather had the Monaro HSV GTS styling? Yes. The Holden design team >>>>>>>>>>>>>> Chevy’s. This is the exact point I made earlier. It simply waters down their brand & costs $$ to produce virtually identical vehicles under a different name. Ford's done the same thing for years. Mid-size TRAILBlazer SS on the same platform as Traverse/Equinox... YES! But the Blazer should be a full-size SUV. Isn't HSV a completely separate entity? Maybe not, but I thought I read that somewhere. Yeah, true. I had an S-10 Blazer back in the day and liked it a lot, but the older full-size models were awesome. Just the performance side of Holden. Didnt they pretty much have that car in a g8 though? The G8 was the previous model Holden Commodore. The SS is the most current, now deceased, Commodore. HSV is the performance line of the Commodore in Australia. We got the V6 G8, V8 G8 GT, V8 G8 GXP, and V8 SS here in the States. All are dead models. Yup. Commodore, G8, SS... all the same car, just different generations. Well before reading these comments I was planning on buying the wife a Tahoe, Yukon or Escalade, but now am second guessing it. I'm needing a 3rd row SUV with captain chairs up front to accommodate a 3rd kid. I've read other places that the newest generation Tahoes/Yukons are not nearly as reliable as the older ones. I've always wanted one, but will look elsewhere. Let me know what you find, we are in the market for 2nd row captains chairs and 3rd row as well. At hopefully a more affordable price than the Tahoe or Suburban. Have you looked at the Durango with 2nd row captains? I haven't. My wife is in a Cadillac SRX now, so she doesn't want to "downgrade". Either way, it'll be a used 2015-2017 SUV.